This Competition is closed. Congratulations to the Winner – Josie Allen. Well there must be something in the air because I have another amazing competition for you today. A few days ago I launched the Audio Bathroom cabinet giveaway and today I have something altogether quite different. It’s the first time I’ve run a competition quite like this and I’m really excited. For the prize in this competition I have this stunning limited edition Patrick Caulfield Wine Bar print from Habitat worth £350. Regarded as the Godfather of British Pop Art, Patrick Caulfield’s strong lines and flat colour palette enables us to experience art and beauty in the mundane and everyday objects around us that we would normally overlook. His work has been widely exhibited in museums and collections internationally and he is considered by artists and art lovers as an icon of British art. Habitat’s ArtPortfolio ‘The Alchemy of Line and Colour’ is a collection of 16 works with 100 limited edition copies of each and celebrates some of the best in talent from artists who have created a legacy of iconic images and inspiration to new emerging talent. Prints by living artists are signed, all are individually numbered. All works are framed and mounted in Dark Birch frames. The collection can be viewed and is on sale in the London stores and online. Wow, can you believe that you have the chance to own one of these pieces? Now because it is such an amazing prize I’m asking you to be creative for this one and to show me your imagination and ingenuity. I want to you follow the steps below to ensure you qualify your entry, and then I want you to photograph something you have framed. Take a blank empty frame, it can be any type, new or old, and then ‘frame’ something. Be as imaginative and creative as you would like to be. You can craft something and insert it into the frame, you could hold an empty frame up and ‘frame’ a view, you could put your most precious photograph inside the frame, or you could even ‘frame’ yourself doing something funny or silly and take a photo of it. The options are endless but you must take a real photograph of your framed creation and upload it to Pinterest. Full instructions are below. If you’re looking for frame ideas, Habitat have a great selection of contemporary picture frames to showcase your favourite artwork and photos. The entries will be judged by me on creativity and originality so get your thinking caps on and show me what you’re made of! 4. Using a blank, empty frame, create a ‘framed’ scene as per the guidelines above and take a photograph of it. 7. Choose your frame photograph from your computer and upload it with the description: “Competition entry to win a Patrick Caulfield Wine Bar limited edition print from Habitat and Love Chic Living“. You can add to the description if you would like to with more information about your frame photo. 8. Come back to this blog post and leave a comment with the link to your Competition Pinterest board. And that’s it! Don’t forget to follow all of the steps to ensure your entry is properly entered into the Competition. 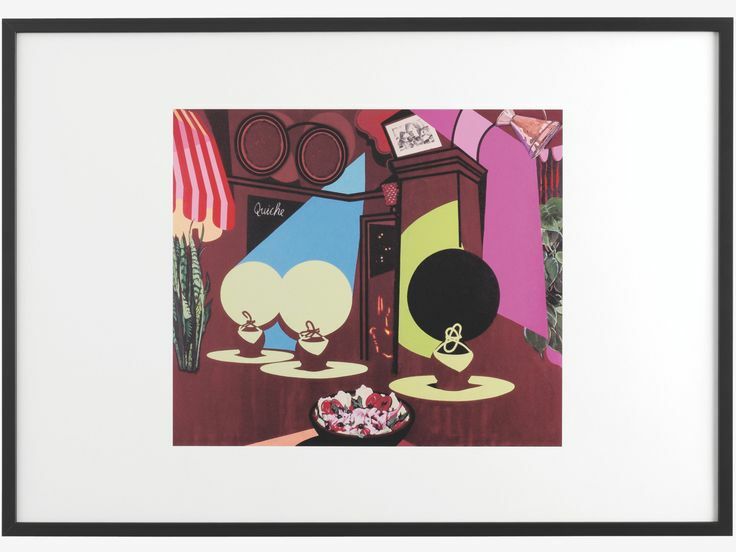 The prize is a framed limited edition Patrick Caulfield Wine Bar print worth £350. There is no cash alternative. Entrants must create a ‘framed’ scene and photograph it, uploading the photograph to Pinterest. Entrants must then leave a comment on the blog with a link to their competition Pinterest board. Winners will be chosen by the Love Chic Living team based on creativity and originality and contacted by email. I love Patrick’s work! What a great prize. Super idea for a competition, although I did have to read the rules several times ha ha! Thanks for entering Di – good luck! Thank you for your entry Lisa – good luck! Fab Prize. Here is my entry. That was fun to do and a different idea for a competition. Brilliant! Thanks for entering Louise, and really good luck! Thanks for entering Ade, and lots of luck! Thanks Simona, and good luck! Great, thanks for entering Julia! Once I started “framing” I couldn’t stop…love his work and Pop Art especially !